With organic lavender & essential oils of bergamot, patchouli & geranium. 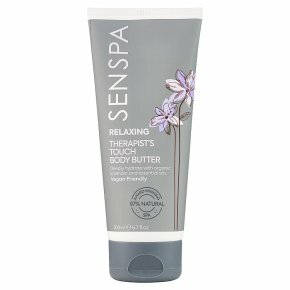 97% natural - natural body therapy.Sen Spa Relaxing body butter combines organic lavender, starflower and jasmine extract with an exotic blend of bergamot, patchouli & geranium pure essential oils. Immerse yourself in the beautiful fragrance and indulge your body with this super luxurious formulation to restore moisture and leave your skin feeling soft, smooth and supple. Directions: After showering or bathing, apply onto dry skin and massage until absorbed. Warning: For external use only. Avoid contact with eyes. Should this occur rinse immediately with warm water.<br>Due to the high concentration of natural oils and botanicals, product may vary over time and from batch to batch, this does not affect the quality orsafety of the product.